Dive into adventure in the crystal blue waters of the Riviera Maya. 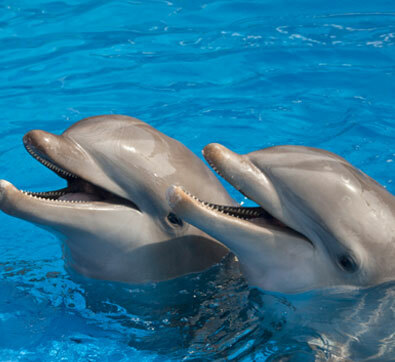 Swim with dolphins in Playa del Carmen and encounter nature's most extraordinary animals. Enjoy one of life's most exhilarating adventures and the ultimate in all-inclusive luxury and spa pampering. The Swim With Dolphins Playa del Carmen Package includes luxurious accommodations in our Zen Grand Suite surrounded by lush jungle, an unforgettable dolphin adventure, gourmet dining at our spectacular Riviera Maya resort. Roundtrip transportation from the resort to the park. Towels, lockers, bathrooms and showers. Luxury accommodation in Zen Grand Suite, Ambassador Suite or Grand Clas Suite with interior Jacuzzi. Rates subject to change without notice, listed in USD per person per night in double occupancy. Minimum three nights stay apply. Maximum suite occupancy two adults, two children under 16 or one infant (0-3 years). Grand Class section accepts children 12 years of age and up, maximum two minors sharing suite with parents. Only one swim with dolphins experience apply per stay. *The admission to Xcaret or Xel-ha parks are not included in the program price. Foto and DVD are not included. **Spa Credit: not cumulative, not refundable and not transferable, valid for treatments of 50+ minutes only. Spa credit do not hold any cash or comercial value and may not be redeemed for cash or other credit. Spa credit is not applicable toward the following: hydrotherapy circuit, beauty salon services or Spa boutique; credits have pre-assigned application that may not be modified or combined with any other resort credit. Package subject to availability and change without notice. Exclusively for individual reservations. Package components are nonrefundable and cannot be substituted. Package is not combinable with other promotions. Blackout dates apply.